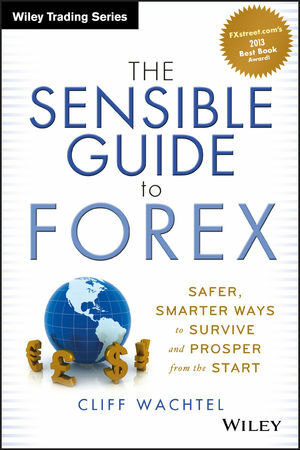 How to achieve currency diversification for lower risk and better returns either via safe, conservative forex trading or currency diversified income investing. The Secret To Great Retirement Planning Made Easy: If you’re getting a safe, high dividend in currency that’s rising, then you don’t have to worry about volatile markets OR low interest rates that will kill your savings and pensions. Your source for solutions. EURUSD Weekly Outlook: Key Correlation Fails, Breakout or Range Trading Ahead? The following is a partial summary of the conclusions from the fxempire.com weekly analysts’ meeting in which we cover outlooks for the major pairs for the coming week and beyond. Normally we first we look at overall risk appetite as portrayed by our sample of global indexes, because the EURUSD has been tracking these fairly well recently. However the past week was an exception to that rule. While US and European stock indexes sold off, the EURUSD broke character and rallied sharply. Therefore the overall risk-aversion the indexes displayed was irrelevant for the EURUSD, and we’ll limit our comments on it this week. We would only warn that the pair doesn’t tend to break from its normal correlations for long. Therefore if the global selloff continues, that adds to the chances for a EURUSD pullback. The daily charts of these indexes are near strong support. For example, the S&P 500 closed only 15 points above 1800. A confirmed break below would be negative for both equities and the EURUSD. 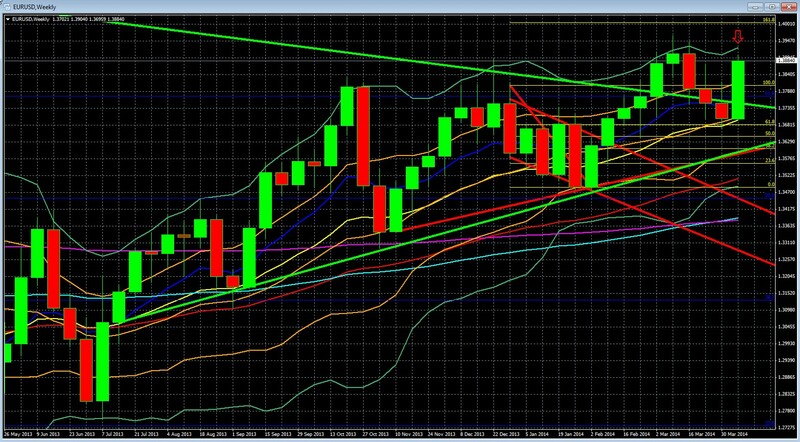 The weekly charts show neutral longer term momentum for the indexes, which is neutral for the EURUSD as well. —Bullish Momentum: The pair is back in its double Bollinger®band buy zone, longer term upward momentum returns, odds favor more upside. Of course this also hold true on the daily chart as recent gains mean shorter term momentum is even stronger by a variety of measures. —Bearish Resistance At 1.4: The pair has failed 3 times in the past 6 months to make a sustained move over 1.39, and hasn’t been above 2011 since autumn 2011. —Likely EURUSD range for the coming week: 1.3950 – 1.3680. We suspect a test into the 1.39 area, but we’ll need a bullish EURUSD surprise for a sustained move over 1.39. Longer term support at 1.368 looks solid given the multiple types of support (price, 61.8% Fibonacci retracement of the prior downtrend, 20 week/200 day EMA). The biggest fundamental question is, why the EURUSD suddenly stopped tracking the overall trends in US and European stocks, and should this behavior continue? The EURUSD has generally tracked the S&P 500 fairly well, yet last week that correlation broke down. Despite the global stock selloff last week, the EURUSD managed to recover nearly 3 weeks’ of losses and return to the upper end of its 5 week trading range. Why? U.S. data hasn’t been strong enough support rising expectations for an acceleration in Fed tightening. Last week we also saw how the dollar did not jump on good data, such as the dip in jobless claims, rise in consumer confidence, consumer credit, and import prices. Fears of disappointing earnings that helped trigger last week’s selloff in US equities also undermined speculation about a stronger than expected US recovery that could bring rate hikes sooner than currently expected. Falling U.S. yields have weakened USD demand. The above factors contributed to driving down benchmark US 10 year note yields from ~2.79% to 2.619% at Friday’s close. Wednesday’s FOMC meeting minutes were arguably the biggest news on that front last week, as they erased any lingering effects from Yellin’s hawkishly-interpreted remarks from the prior weeks. ECB officials’ downplaying the chances for any near term QE bolstered expectations that both the ECB and Fed are not making any policy or other changes that would change the difference between EUR and USD benchmark rates. More on that below. …some expressing concern that this component of the SEP could be misconstrued as indicating a move by the Committee to a less accommodative reaction function. However, …Most participants favored providing an explicit indication in the statement that the new forward guidance, taken as a whole, did not imply a change in the Committee’s policy intentions, on the grounds that such an indication could help forestall misinterpretation of the new forward guidance. Unsurprisingly, in response stocks rose, the USD fell and drove up the EURUSD. While inflation held steady in Germany, it fell in many other EZ states last month, including France and Italy. Although some believe these weak inflation readings will put more pressure on the ECB to take policy action, we remind readers that Germany is less likely to accept new, EUR dilutive stimulus measures as long as it isn’t a German problem too. At the last ECB meeting, president Draghi proclaimed that the bank’s governing council was united in its commitment to radical action to fight dangerously low inflation, sparking a rally in GIIPS and other EU sovereign bonds. Italian, Spanish and Portuguese bonds quickly fell to multi-year lows. Greece held its first bond sale since 2010, receiving €20bn in orders for €3bn worth of five-year bonds, yielding less than 5%. However senior EU officials say that the ECB will not use unconventional stimulus policies if the economy performs in line with their March forecasts. Moreover, in contrast to Draghi’s claims of a united front, QE remains a controversial policy fraught with political risk and technical difficulties concerning which bonds it buys, when, and under what circumstances. See here for details. Like any stimulus, this would be viewed as EUR dilutive, because whatever the technical differences between QE and outright money printing, markets don’t make the distinction, so falling expectations for new easing are bullish for the EUR. Of course the ECB has other, preferred options to ease besides QE. It could cut interest rates, lower the ECB’s deposit rate for banks to negative levels or narrow the rate corridor. However few expect any ECB policy changes until the next big ECB meeting in June, when the policymakers have their latest economic projections. So until then, the only likely threat to the EUR is ECB officials attempting to talk the currency lower by complaining about its strength hurting growth. Compared to the above bullish fundamental EURUSD drivers, the below bearish factors are less likely to have an impact next week. The EURUSD is now once again near the top of its 5 week trading range at 1.388. That doesn’t leave a lot of room to move up before hitting tough resistance in the 1.400 area. The big 3 fundamental reasons for USD weakness noted above are already old news, so there’s no clear bullish fundamental driver for the coming week that would justify a sustained move beyond the strong 1.4000 zone. That said, there are plenty of potential factors to drive the pair back to at least the lower end of its trading range. Yield seeker’s demand for European stocks and bonds has underpinned EUR strength for some time now. Greece’s return to credit markets is yet another sign that markets have discounted the chances of a Greek default despite prior ‘voluntary’ haircuts in 2012. Yet there are signs that the rally in EU bonds, especially those of the periphery, may be ready to reverse as their yield advantage over more creditworthy borrowers has narrowed. See here for details. Thus far the 1.4 level has been more than just a strong technical resistance point, and investors may begin to speculate that the ECB will become markedly more vocal about the exchange rate if the pair approaches that figure. Another threat to last week’s EURUSD rally is new concerns in the Russia-Ukraine conflict. –Ukrainian pro-Russian activists held violent demonstrations in Eastern Ukraine, prompting accusations that Russia was once again promoting turmoil to provide a pretext for yet another seizure of Ukrainian territory. –Ukraine’s failure to pay its gas bills to Russia has led to a more justified Russian threat, this time to cut off gas to Ukraine unless it pays up. That’s a problem for Europe because it would mean a cutoff of the 15% of European gas supplies that flow via Ukrainian pipelines. This is likely more of a message to Europe to lend Ukraine funds and so allow the gas to flow, and the EU is working on a loan package as of this writing, and most observers believe a loan deal will keep the gas flowing, as this is in everyone’s interest. Obviously Russia doesn’t want to risk burning its export markets, and knows that Ukraine’s economy is a mess. Putin has no shortage of more direct ways of holding sway over Ukraine. In sum, the crisis and its potential to escalate remains another source of fundamental uncertainty hanging over an EU that has plenty of economic challenges already. The conflict is over what form of support a state can provide to a lender in difficulty without triggering a so-called bail-in, where losses are imposed on private investors who lent money to a bank. In essence Britain wants the option to provide tax payer funded bailouts in order to protect its huge financial sector from a loss of investor confidence that private sector bail-ins create. Some states support this, others don’t, depending on their position on who should pay for bank bailouts – taxpayers or the banks depositors, lenders, and investors. With the EURUSD already back near long term resistance of the 1.400 zone, a delay in the EU parliament vote could be the excuse for a EUR selloff, as it would serve as yet another reminder that the EU remains vulnerable to another contagion threat and has thus far been unable to make the needed reforms. See here for details. Mario Draghi’s bold promise that he’d do “whatever it takes” to save the EZ from solvency and contagion threats was one of the greatest acts of verbal intervention in the history of central banking. The OMT program’s mere existence, not its actual use, was enough to stem fears of a banking collapse in Spain that showed signs of spreading to Italy and beyond. It bought valuable time, but that grace period is not infinite. 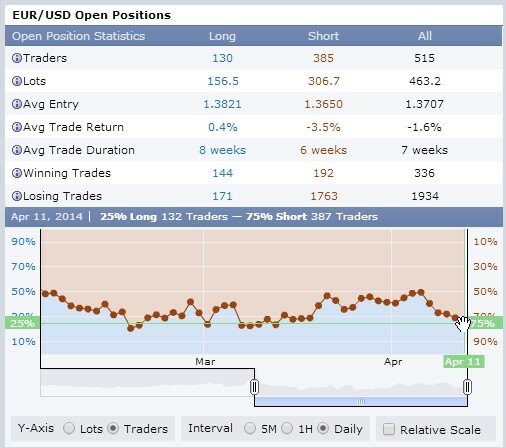 Our real time sample of retail traders has made a major positioning shift over the past week, from being 50% long/short to 25% long 75% short. In aggregate they appear to have been taking profits on their EURUSD longs over the past week, and now they’re clearly expecting a bounce lower back into the recent trading range. It’s a light calendar for EU and US top tier risk events, and a holiday shortened week too. However it’s the second week of Q1 2014 earnings season, and the first with a large number of top names reporting. This could be the big driver of sentiment. Tuesday: The German ZEW survey is scheduled for release next week along with Eurozone consumer prices, current account and trade numbers. The forces undermining the USD (unimpressive US economic data, earnings, and yields) are likely to continue to support the EURUSD above 1.368 in the coming week despite the EUR’s worse looking longer term prospects, due to the strong support at that level on the above weekly chart and recovered upward momentum. The earnings season has just begun and expectations are high for Monday’s US retail sales report. Last week the USD didn’t rise on positive US data. So retail sales will need to smash expectations and rise 1.5% or more for there to be any hope for a rise in US rate expectations. Even then, with fed officials quick to dampen such expectations, even great US data probably won’t help in the near term. We need sustained strength in US growth, or some bearish EUR news, for a sustained EURUSD reversal lower. If we get a sustained period of strong US data, only then will the fed feel enough pressure to counter its current dovish bias. The big potential for a breakout, if any, lies with the burst of major earnings releases this week. Your thoughts, dear reader? We’d love to hear them. To be added to Cliff’s email distribution list, just click here, and leave your name, email address, and request to be on the mailing list for alerts of future posts. DISCLOSURE /DISCLAIMER: THE ABOVE IS FOR INFORMATIONAL PURPOSES ONLY, RESPONSIBILITY FOR ALL TRADING OR INVESTING DECISIONS LIES SOLELY WITH THE READER.